Time for a book by a new author and also a book that I really enjoyed! It took me one day and a half to finish this one because it was such a huge page turner. I already finished 200 pages on the first day, if I wasn't tired I would've probably finished it in one sitting. 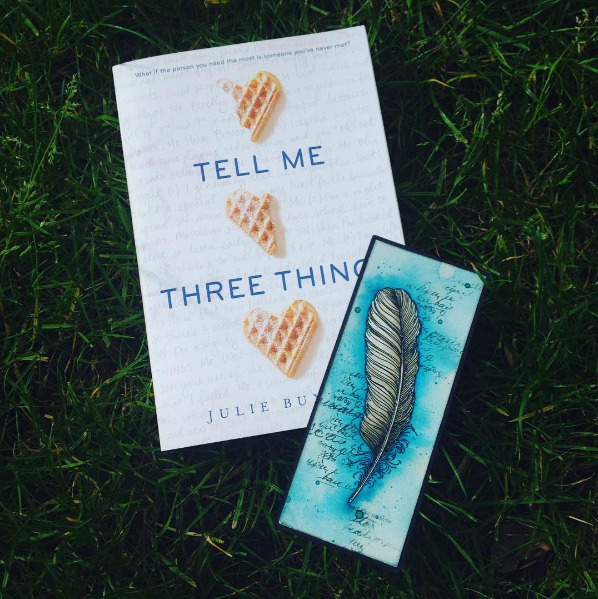 A recommendation for this summer: Tell me three things by Julie Buxbaum! First of all there's Jessie! I have to say I was absolutely stunned reading her part in this book. She's a very sweet girl, very open towards others but then there's also her being so shy which makes it even more difficult for her. It's clear from the start that Jessie has a hard time adjusting to her new life style as her head keeps going back to past events and memories of where she used to live. People at school also don't make it easy for her and she doesn't make it easy for them. At some point in the book we really see how vulnerable but strong this character is. She might have been making friends, especially with the help of the all too famous SN, there are also enemies. I think that's a very relatable aspect in the story as well, the people who you don't get along with or that will judge you the moment you arrive. Soon we see that she's having some bullies and I really loved how we saw Jessie grow and be strong for herself. It was relatable and a amazing role model for a lot of people out there. In general I have to say I really loved this character since she has a realatable character and background story for I bet a lot of people out there. She also grew a lot during this book and shows how something bad can turn into something brighter. The only remark I have in this character was the fact that she was sometimes a little bit too consumed by her own situation and own thoughts which made sure that she sometimes forgot about the others around her. Other than that I loved to read in her perspective! Another character I want to discuss is this SN person. I'm a sucker for books like this: the anonymity of well... kinda a savior! I absolutely loved this SN person. From page one we know it's also a guy which really made me excited to find out how the bond between our main character and SN would become during the book. SN really is somewhat a savior as he really pays attention to Jessie and also looks out for her from afar. The representation we get from him in the mails is also a very caring guy that wants to meet Jessie but is scared to. I guess that also made sure that we stayed excited for SN and also got a soft spot for him. In general this character was very well written even though we only see him in the mails during the book which I think is a very big asset to this book. Even though we only see him in the mails, I think we get a very good picture of how this character is or may be in real life and that made sure that our speculations could begin. The biggest question always is do we even know who SN is? The author might just make him a character that will never be spoken about next to the mails... I really adored reading SN's mails and also really enjoyed him as a person too. As for the plot I have to say this is a 9 out of 10 for the level of swoon-worthy! This damn book got FEELS! I love it when books make me feel this deeply and Tell me three things is absolutely one of those books. There's also so much more next to love affairs that Jessie is going to encounter in this book. I mean, Jessie has so many problems and drama around her head at home but also at her new school and also at her hometown where she will be going back to during the book. The author really played this book on so many different levels and aspects it never got boring and just stayed interesting to read. As I already mentioned before this book is a huge page turner, which has to do with the fact that there are so many facets to this book but also because of the thrill and excitement about SN. Even though I wished to see even more of SN through mails I was very satisfied with him and so excited to know who this person would be and if we'd ever know. The anonymity this character brings so much more to the general plotline because he's everywhere and nowhere at the same time, only communicating with mails. The best part yet is that we can speculate as much as we want as we'll see different guys through the book and get hints from SN about who or how he could possibly be in real life. The speculations also make sure that we stay excited and pay close attention to all behavior from our men in this book! Although I have to say when you passed half the book, it seems a little bit predictable to who it might be and that's something I really found a sad thing. The author could have used SN for so much longer if she could have kept up the anonymity but on that part I think the book got a little too obvious and a little too expecting. Not that I minded it that much, I still was really excited and still am really in love with this book! I just think that it got predictable which is just a bummer when you've been speculating and being excited for so long during the book and then just know before the very end! At last there's the title that's being used in the book and got me very excited! Tell me three things is sort of like a game between Jessie and SN where they each tell each other three random things. I found this also one of the things that made the book very cute and adorable but also very excited because it had hints of who SN might be. Overall I think that was just such a cute thing in this book that showed how close SN and Jessie really are but also showed us more about their personalities which was an asset in my opinion. Oh and not to spoil anything at all but because of all situations Jessie has been in and who she all met with or without the help of her friend SN, Jessie will find her in better situations but also make new harder situations for herself. This is the part where Jessie will have to use her strong personality traits to make decisions and man, we won't be disappointed. I really loved how the author made this somewhat predictable ending funny by a little twist! Overall this book has really surprised me but also really made me excited. 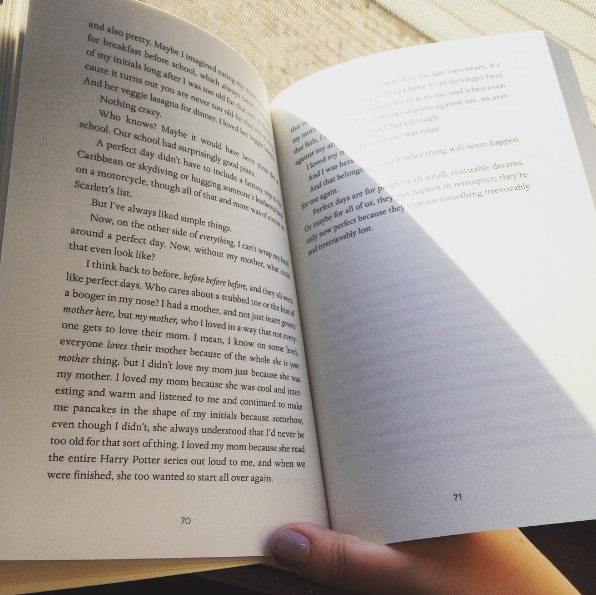 Julie Buxbaum really concentrated on many aspects of life which made sure that the book was equally balanced and also stayed really interesting. On top of that the book is really swoon-worthy and very cute which makes it the perfect read for this summer. The only aspects that were kinda sad or disappointing were that it was a bit predictable near the second half of the book and also that our main character was sometimes self-absorbed which made her forget about everyone else while her character isn't like that at all! I was really excited to find out who SN was and what he'd become in Jessie's life and how he had an impact on this character. Both of them really connected which was amazing to see. And as far as I can tell here are 3 things: (1) this book was so cute! (2) it's a huge recommendation (3) tell me three things! "Perfect days are for people with small, realisable dreams. Or maybe for all of us, they just happen in retrospect;"